Home Our Work Our news Vendors get support to go digital! 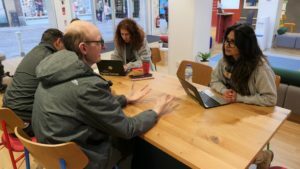 So we have teamed up with the experts at Google Digital Garage, who put on a session to provide digital skills training to vendors at their pop up office in Manchester. We plan to continue with our digital skills initiative for vendors, and already have another Google Digital Garage workshop lined up in Sheffield. We will keep you updated, so watch this space! If you would like to support vendors to update their skill sets, taking the steps to move into mainstream employment, make a donation to our Trust today. Friends of Big Issue North Summer 2018 Newsletter is Out Now! Interact: Responses to Vendors get support to go digital!